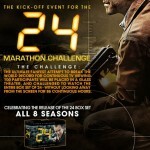 LA Times has some more details on the 24 Marathon fanfest event starting tonight. 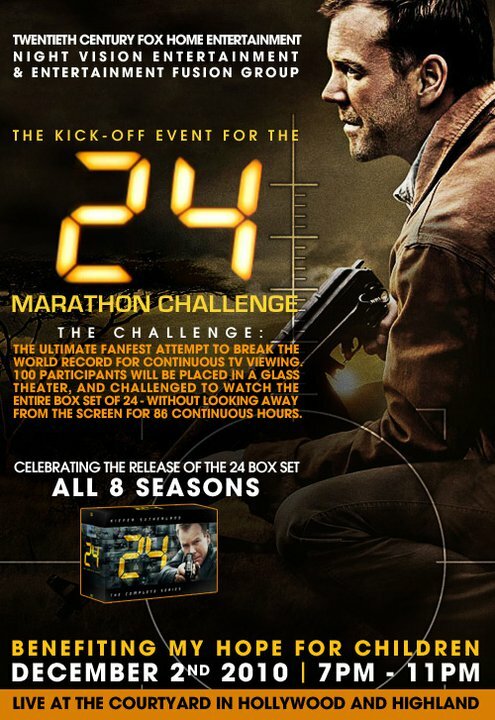 One hundred participants who signed up for The “24” Marathon Fanfest will be put inside of a glass cube measuring 60-by-40 feet at the Hollywood and Highland complex in Hollywood starting Dec. 2, and will compete against one another by watching as many straight hours of the Fox action show as their bodies can handle. Not only will the last viewer left sitting/awake win $10,000 in cash, but they will also get bragging rights as the No. 1 “24” fan in the land. 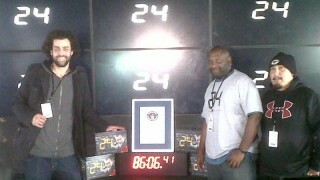 Further, if they can show Jack Bauer-like stamina, they could even become a Guinness World Record holder. Efraïm van Oeveren of the Netherlands currently holds the record for the longest time continuously watching television, at 86 hours. Brett Hyman, president of Night Vision Entertainment, who are producing the event, said there are definitely some particular rules to follow, many mandated by the Guinness people. First, they have to stay awake the entire time. They do get a 5-minute break for every hour they complete watching, and they can accumulate time (i.e. 4 hours = 20-minute break). The watchers also get three meals a day from the Hard Rock (and 2 snacks) every four hours until midnight. The attention that the “24” watchers will get may affect the outcome, too. Hyman says there will be 120 people writing in logs and helping out with the participants, plus whoever walks by on one of the busiest corners in the county. Jon Cassar announced on his Twitter that he will be in attendance supporting the fans. More 24 cast members are scheduled to appear, though nothing has been announced as of yet. and carlos bernard is my favorite man ever!!!!!!! i can promise you that if i go to this maraton i will win without any douts!